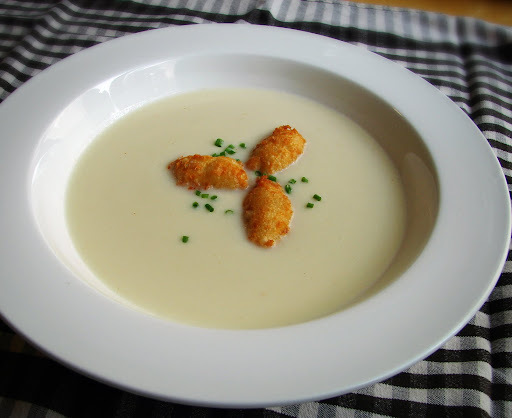 Food Wishes Video Recipes: Cream of Cauliflower with Blue Cheese Fritters – The Best Soup I've Ever Made? Wow chef--thank you!! That soup looks great! Plus the fritters are an awesome idea. I have been hoping you would soon show us a Choux how-to.. This seems like a great veggie style hot soup on a chilly day...so just like I love your chicken lemongrass thai soup, I'll add this to the recipe list. Holidays are coming up--your porkporken would be a great recipe to film to go with this soup! That looks great. Anyone else get the idea to make a metric tonne of the fritters and use the soup as a dip? ShopRite, a fairly large supermarket chain in the NY/NJ/CT area has grass-fed beef tenderloins (whole only, around 6-8 lbs) on sale for $3.99/lb this week. FWIW, down here in the boondocks of Louisiana it's $13.99 not on sale.... Dang, I wish I was a yankee. First time to enjoy your blog and I'm STAYING! So many great recipes. My connection is dial up so it takes too long to enjoy the videos hopefully I'll upgrade so I can enjoy everything. I arrived looking for a no knead bread recipe and won't be leaving anytime soon. Thank you for a great well written site I can't push myself away from the monitor. That's a good sign, looking forward to more time here. Chef, this looks like a Hall of Fame recipe. I've already told people how good it'll be and I haven't even made the damn thing yet. I'm salivating. Now the important stuff: at the 4:30 mark of the video did you really do the whole forward/reverse editing technique?!? Holy Toledo!!! Did you really think you'd get that by me!?!? The last time I'd seen that done successfully was on a Banana Splits episode, when Fleegle seemed to be infinitely slipping/windmilling on a freshly mopped floor. Nice going! You oughta win some kind of award. Can't wait to try the soup, Chef. If you read no further than the first sentence of this post, know this: YOU MUST MAKE THIS SOUP! Chef John saying "it's the best" guarantees I'll try the recipe, and am I ever glad I did! Like Birder, those fritters got to me, so I doubled the recipe. Glad I did too, because no one touched the crusty baguette but nary a single fritter crumb escaped. Thank you again for your inspiration, Chef John! Chef John, i don't fave a deep-fryer. What happens if i bake the fritters? Thank you. must be fried, and I don't have a deep fryer either! just use a small pot. thank you. OBVIOUSLY i couldn't help myself and made a batch before getting your reply. i ended up frying them in a pan. wasted some oil, but they were in-cre-di-ble! the outside was so crunchy, and the inside was so soft and cheesy. when i die, i want to be burried in one of these! fritter heaven! I made this a one of the best soups I have ever had. Also, very easy. Gave the reciepe to mom and grandma they both love it. is there a substitute that will work in place of the blue cheese? thanks for posting this video... didn't realize how easy it is to make a basic soup that tastes good and on the cheap. Fantastic soup and so easy too. Thank you for this wonderful recipe! I'm already imagining variations on the blue cheese fritters. Oh and cauliflower is my new favorite veggie! I noticed you said there really isn't a substitute for the blue cheese but I'm not a fan of blue cheese, can I use feta cheese for the fritters? Maybe freeze the feta first so it's not too soft? I'm making a list of all the recipes I want to try from your site. Thank you for your videos, they're really helping me. Hi Chef John, an amazing soup, love the nutmeg flavour with a touch of heat from the cayenne. What do you use for oil when cooking the fritters? We used Canola Oil and it does not seem to have a very high heat temperature prior to it starting to smoke. Love your site and have recommended the site to many Canadians in the Great White North. I made cauliflower soup but it came out gritty. I'm not sure what I did wrong. What kind of immersion blender did you use? cuisinart i think. sounds like it wasnt soft enough. Has anyone tried using a different cheese either than the blue? Brie, goats, feta? I reserved half the cauliflower, seasoned with a little garlic, olive oil, and fresh ground pepper and baked at 450 for 30 minutes. When the soup was ready for the blender combined everything and blended. Amazing depth! It will darken the soup a little but adds amazing flavor! Hi Chef, is there an egg alternative for the fritters? They look amazing but my family doesnt eat eggs....I'm making the soup this week for sure! Thanks. Not realty. Are they allergic? They would NEVER know there is egg in there. I dont like blue cheese, can I subtitute? thanks! Hi Chef John! My mom, sister and I always read your blog and I'm glad I searched "cauliflower" because these 2 recipes are AwEsome! I substituted bleu cheese w/feta cheese and it was amazing, and I also used spelt flour. The fritters turned out very tasty. I roasted the cauliflower 'til they were a little burnt on the edges and golden brown. Then I threw them into the soup and simmered them. Is it possible that I did not simmer for long enough...my end product did not end up as liquidy as your soup. My end product was more gritty...not as smooth. The only thing I could think of was that I didn't simmer for long enough. Your professional opinion? I want it to be liquidy the next time I make it. I made this recipe tonight for dinner along with the fritters. Yummy! The only problem is that my soup tasted watery. I didn't use the chicken stock because my daughter is vegetarian; I used water instead. I used the amount called for in the recipe. After the cauliflower is simmered and soft, do I strain it before blending, or do I use all the liquid? Also, will a vegetable stock work with the flavors instead of chicken stock? Love the bleu cheese fritters...and I don't like bleu cheese. Wow, Chef John! Thank you for such a fast reply. You rock - awesome!!! Wow, Chef John! Thanks for such a fast reply. You rock! Thanks for all the help and info. Good to know about the salt...and it worked! After reading your reply, I added more salt...VOILA! I added some cayenne and dash of hot sauce. Totally awesome. 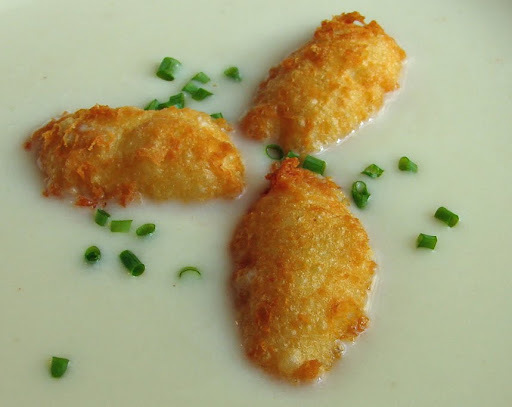 Love the soup and fritters, and both are so quick and easy to make. Being a lover of soup I made this recipe in its entirety last night...verbatim. It encompassed all the things that I like when selecting a recipe. This is the first of your recipes that I have made since I discovered your blog just recently. You passed with flying colors and I will continue to put your blog and recipes at the top of my personal search engine when looking for that special recipe.